Duxbury, L. and Higgins, C. 2009. Key findings and conclusions from the 2001 National Work-Life Conflict Study. Health Canada; Ottawa, Ontario, accessed at http://www.hc-sc.gc.ca/ewh-semt/pubs/occup-travail/balancing_six-equilibre_six/index-eng.php on January 15, 2012. A recent study on work-life conflict included 100 Canadian companies with 500+ employees. The study included 31,571 people, 55% of which were women1. This study showed an overall increase in work hours from 1991 to 2001. 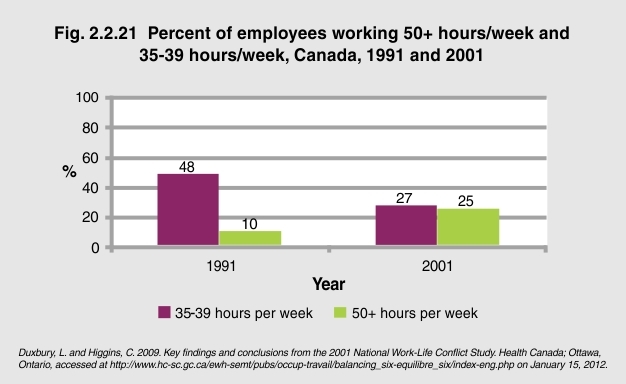 Employees working 50 or more hours per week rose from just 10% in 1991 to 25% in 2001. Employees with a 35 to 39 hour work week decreased over that period from 48% to 27%. It was estimated that no fewer than one in four but as many as 60% of employed Canadians struggle to balance their work and home lives. This speaks almost exclusively to the demands of caregiver duties, either for an elderly parent, an ill family member or a child or children. 1 Duxbury, L. and Higgins, C. 2009. Key findings and conclusions from the 2001 National Work-Life Conflict Study. Health Canada; Ottawa, Ontario (http://www.hc-sc.gc.ca/ewh-semt/pubs/occup-travail/balancing_six-equilibre_six/index-eng.php).